Description: The base of this sea anemone is lightly adherent; the column is not divided into regions, and does not have suckers or other features. It is fairly short and cylindrical, acontia are freely and copiously emitted. There are up to 100 tentacles which are irregularly arranged, rather stout at base tapering to fine points, moderate in length. 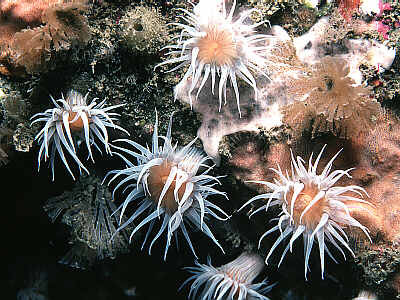 The colour is white, the pigment being rather patchy on the disc and column, more even on the tentacles. The column has faint longitudinal greenish stripes. The disc is sometimes orange/yellow in colour. Size is up to 50mm across tentacles. Reproduces by longitudinal fission. Habitat: Occurs on the shore and in the sublittoral, down to 50m. Usually on rocks- on flat surfaces rather than in holes or crevices, on Laminaria (kelp) or other sea-weeds. Specimens found on shore are usually smaller, up to 30mm across, and with fewer tentacles than sublittoral ones. Often found in company with Corynactis viridis and Caryophyllia smithii in exposed sites. Usually conspicuous if present. Distribution: South and west coasts of Britain to west Scotland. West and north France. Locally common, often in large aggregations. Similar Species: Not easily characterized but nevertheless very distinctive. Sagartia elegans vars. venusta and nivea have similarly coloured discs and tentacles but the suckers on the column and more slender tentacles should distinguish these. Plain colours- all white or white with yellow disc. Picton, B.E. & Morrow, C.C. (2016). Actinothoe sphyrodeta (Gosse, 1858). [In] Encyclopedia of Marine Life of Britain and Ireland.